Aldi Süd has put its organic vegetables in the combisafe carton pack from SIG Combibloc on German supermarket shelves in preference to metal cans. This packaging alternative to the classic food metal can offers comparable product protection and the same kind of shelf-life for the food it contains, but it also scores for its environmental benefits. Compared to other packaging solutions for long-life foods, using combisafe can reduce CO2 emissions by up to 54 per cent, and the consumption of fossil resources by up to 59 per cent. Since February, Aldi Süd has organic baby carrots, organic kidney beans and organic peas in the combisafe 300 ml carton pack from SIG Combibloc on supermarket shelves. combisafe is a carton packaging solution that is suitable above all for particularly chunky foods, and at the same time for filling all food products that do not flow freely and therefore cannot pass through a pumping system and an aseptic process. This includes, for instance, vegetables and pulses, fruit, convenience foods and stews. Volker Bubacz, head of marketing at SIG Combibloc, Europe, stated: “The total package that combisafe represents was a key factor for Aldi Süd in incorporating the innovative carton pack into its range. combisafe ticks all the boxes you’d expect for long-life food packaging, and at the same time it offers environmental benefits. Carton packs are proven to be among the most environmentally friendly packaging solutions for long-life foods. In a life-cycle assessment conducted by the Institute for Energy and Environmental Research (IFEU), it was demonstrated that in the line-up against food metal cans, glass jars, plastic stand-up pouches and plastic pots, the carton pack has the best environmental performance. “Compared to other packaging solutions for long-life foods, using combisafe can reduce CO2 emissions by up to 54 per cent, and the consumption of fossil resources by up to 59 per cent”. Also in terms of logistics and advertising effectiveness on the sales shelf, carton packs clearly outperform competing packaging solutions, the company said. 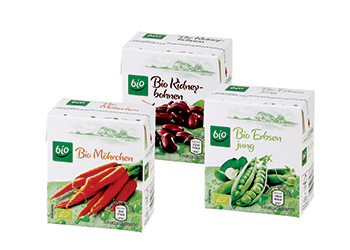 In addition, carton packs from SIG Combibloc are free from Bisphenol-A. The combisafe carton packs for the organic vegetables from ALDI Süd, filled by food manufacturer Jütro GmbH Konserven und Feinkost (canned foods and delicatessen), are marked with the label of the Forest Stewardship Council (FSC). The label confirms that the paperboard used to make the package is sourced from responsibly managed forests and other controlled sources.